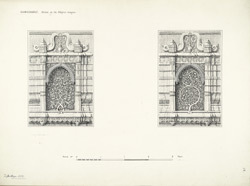 Illustration of niches from the mosque of Shaikh Hasan Muhammad Chishti located in Shahpur, north of Ahmadabad. Shaikh Hasan Muhammad Chishti (d.1574), of the Shahpur Qazi religious order, built the mosque in 1565-66 for his followers. This small mosque's interior dimensions measure 59 feet in length by 38 feet in depth. A square of twelve pillars, in the central area of the mosque's interior, supports the central dome, which is actually position on the second floor. Within the interior, there are a further forty-four pillars to support the roof and arches in the façade. On the ends of the façade, there are two minarets ?are exuberantly rich in their carvings: in this respect, indeed, they are among the most elaborate in Gujarat, and the traceries of the niches have attracted much attention, as surpassing almost all others.? The veranda on second storey consists of a richly carved balcony and the continuation of the twelve central pillars to support the central dome.